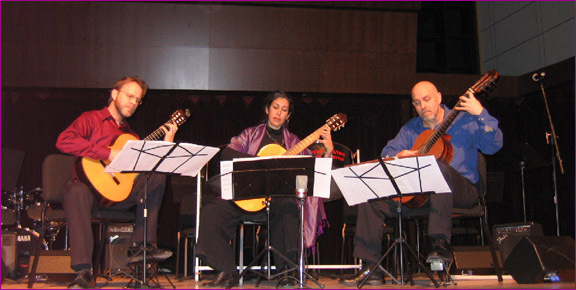 The Back Bay Guitar Trio is a high class, Boston based trio consisting of three very experienced musicians. In addition to their busy concert and recording schedule, they also are available to provide quality music for special occasions: weddings, parties, dinners, house concerts, corporate and private events. The trio play a mixture of popular jazz, well loved classical selections, and timeless songs. Their sound and treatment of the music is unique; ranging from beautiful, mellow and moody standards to hot, lively jazz and latin numbers. This is music to give your party or gathering a real touch of class: an ideal background to a special meal, or a sophisticated sound to warm up your guests at a cocktail party. It is also perfect if you want something out of the ordinary for your wedding ceremony. An unconventional string trio with a memorable sound. The trio can play without amplification for small, intimate gatherings, or with a P.A. system for both indoor and outdoor events. We enjoy collaborating with other artists and would be happy to add a vocalist, pianist, string or woodwind player to augment our ensemble. Performing fees are very affordable and we will work with you at every step of the process to ensure your musical needs are met. You can reach us by email or phone. See our Contact page for full details.